Web Hosting Hub offers robust servers that will provide your store visitors with a faster load time which will make them happy. We offer SSLs to make sure that all transactions in your online store don't get compromised. How much would it cost you if your website went down for an hour? With us, you won't have to worry. Your store will be open for business 24/7! Whether it's PrestaShop pre-installed for free on your account creation or Magento via our auto- installer Softaculous, Web Hosting Hub has the right app to get your store online quickly! After you decide on which app to utilize for your store you can easily add a theme to it. There are thousands of free themes you can pick from to match your look and feel. 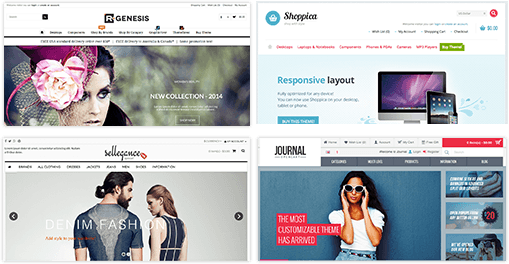 Build an online store that matches your brand and style. Web Hosting Hub's technical support team is well versed in all the popular shopping carts used to build successful online stores. We will help you through the technical process of installing your shopping cart and quickly getting your store online. Don't let the transfer process intimidate you. We provide full support for all eCommerce stores installed via Softaculous. Our eCommerce technical teams are standing by to help you migrate your store over from your previous host.